Former U.S. President and Carter Center Founder Jimmy Carter announced today that only three endemic countries remain in the fight against Guinea worm disease, poised to be only the second disease in history-after smallpox-to be eradicated. "Guinea worm disease is fewer than 1,800 cases away from becoming only the second disease in history to be wiped from Earth," said President Carter, who was joined by former Nigeria Head of State General Yakubu Gowon, Nigeria Federal Minister of Health Prof. Onyebuchi Chuwku, Nigerien Counselor Boubacar Moussa Rilla, and other dignitaries from around the world for the The Carter Center Awards Ceremony for Guinea Worm Eradication to honor Nigeria and Niger. "Nigeria and Niger's recent success halting transmission of this ancient and horrible affliction provides yet another vivid reminder of how people in even the most marginalized circumstances can thrive when given the tools and knowledge to help themselves," President Carter said. 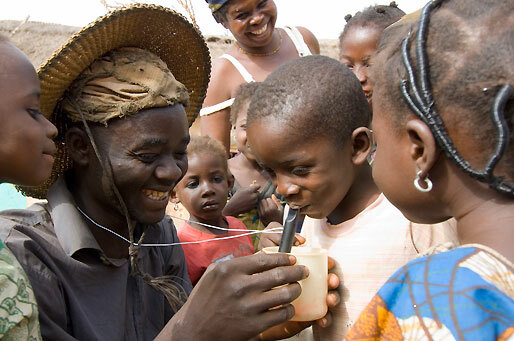 (Click to enlarge) A Guinea worm health volunteer in Ghana, educates children on how to use pipe filters when they go to the fields with their families. Pipe filters, individual filtration devices worn around the neck, work similarly to a straw, allowing people to filter their water to avoid contracting Guinea worm disease while away from home. In 2010, fewer than 1,800* cases of Guinea worm disease were reported, 94 percent of which remain in Southern Sudan, with a handful of cases found in eastern Mali and western Ethiopia. Ghana likely has reported its last case and is expected to make a formal announcement later this year. When The Carter Center began spearheading the international campaign to eradicate Guinea worm disease in 1986, there were an estimated 3.5 million cases in 20 countries in Africa and Asia. "The last cases of any disease are the most challenging to wipe out, especially when stability is threatened in the endemic communities of Southern Sudan and Mali," said Carter Center Vice President of Health Programs and smallpox expert Dr. Donald Hopkins. "But, we know that with the international community's support, eradication of Guinea worm disease is not a question of if, but when." 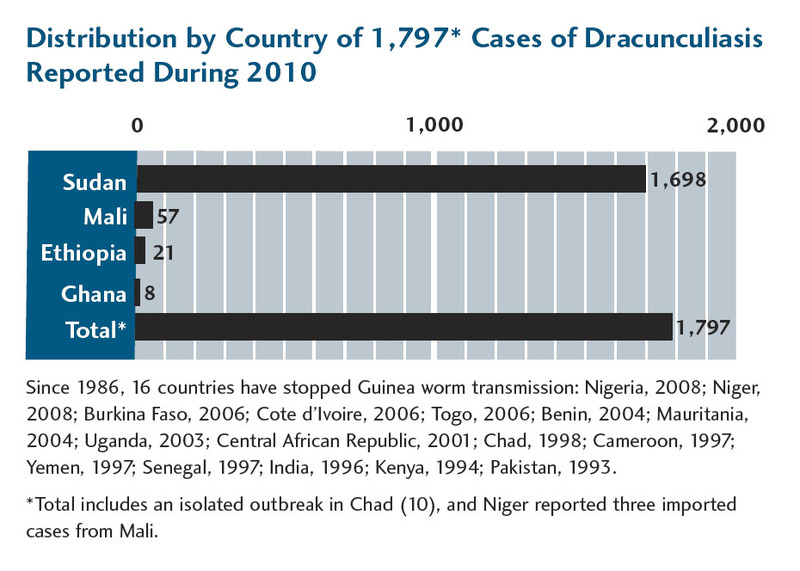 Also known as dracunculiasis, Guinea worm disease is a debilitating parasitic infection that affects people living in remote, poverty-stricken communities. The disease is contracted when people consume water contaminated with infective Guinea worm larvae. After a year, a one-meter-long worm slowly emerges from the body through an agonizingly painful blister in the skin. There are no vaccines or medicines to prevent or treat the disease. Guinea worm is being wiped out chiefly through health education and behavior change, for example using simple tools like water filters to prevent the disease.